ST. PETERSBURG, Fla. - Over the course of 162 games, every manager in baseball has to balance the desire to win with the necessity of protecting his pitchers for the weeks and months to come. Bobby Valentine has adhered to the rules in his first season as manager of the Red Sox, even using outfielder Darnell McDonald to pitch in an extra-inning game earlier this month rather than overwork the bullpen. But there was something different in the stale air of Tropicana Field on Thursday night. 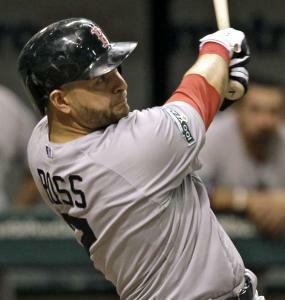 The Red Sox pursued the Tampa Bay Rays like it was October, not May. The result was a 5-3 victory over the Rays and satisfied smiles in every corner of the clubhouse. Valentine used five relievers to get the final 10 outs, at one point sending out Rich Hill, Scott Atchison, and Andrew Miller to face one batter each. Then it was left to Vicente Padilla and Alfredo Aceves to finish up. The bullpen, so fractured to start the season, protected the lead for Felix Doubront as the Red Sox won for the sixth time in seven games. “Sometimes I’ll take some future considerations. There weren’t any future considerations tonight,’’ Valentine said. It was a message the players wanted to hear. The Rays, who entered the game tied for first place in the American League East, were the team that caught and passed the stumbling Sox last September and grabbed the wild-card berth. They’re young, talented, and cocky, everything the Red Sox once were and aspire to be again. The game was particularly redeeming for Ross, who misplayed a popup in right field on Wednesday that gave the Rays the winning run in a 2-1 game. He atoned for that with a bases-loaded walk in the first inning, a solo home run in the third, and a two-run single in the eighth. “I felt really bad about last night, to come out today and pick up the team and get a victory and split the short series is really big for us,’’ Ross said. There were a few sparks in the game, too. Red Sox first baseman Adrian Gonzalez, who has not hit a home run since April 17, said Wednesday night that he would end that drought the next day. Gonzalez was not entirely serious, but the Rays took offense. Before the game, a fan suggested on Twitter that Tampa Bay starter Matt Moore hit Gonzalez with a pitch. Rays pitcher David Price reposted that comment on his Twitter page, a tacit endorsement. Gonzalez came to the plate in the first inning with runners on first and second. Moore’s first pitch, a 94-mile-per-hour fastball, hit Gonzalez to load the bases. Gonzalez showed no reaction on his way to first base and finished the game 0 for 3. He later said he didn’t think it was intentional. Moore struck out Will Middlebrooks on four pitches for the second out. But Ross worked a walk, seeing eight pitches before Moore missed with a changeup. In the third inning, Doubront drilled Luke Scott with a fastball with two outs and a runner on first. It appeared to be retaliation and Scott yelled at Doubront from first base. As was the case for the Rays, revenge proved costly for the Red Sox as Jeff Keppinger singled in a run. The Red Sox also got into it with plate umpire Dan Bellino. Mike Aviles was ejected for the first time in his career after taking a called third strike in the seventh inning. Several others also disagreed with Bellino’s interpretation of the strike zone. Doubront (4-1) allowed two runs (one earned) on six hits with four walks and seven strikeouts over 5 2/3 innings. “With all that nonsense he gave up two runs. That’s a heck of a job. And there was a lot going on,’’ Valentine said. Doubront left with a 3-2 lead that grew to 5-2 when Ross singled through a defensive shift to drive in two runs. Padilla allowed one run but the bullpen was otherwise up to the demands Valentine put on it. A glaring weakness in April, the bullpen is now a strength. The relievers have a 1.38 ERA since April 23, the best in the majors.